Read Below for pictures and uses for screenings. Screenings have a multitude of names such as FDOT asphalt screenings, concrete screenings, paver screenings, 250 screenings, 89 screenings, commercial 131 screenings, commercial 132 gunite screenings, FDOT 132 Screenings, granite screenings, paver sand, 131 screenings and just plain old screenings. Screenings are a byproduct of other processed materials. 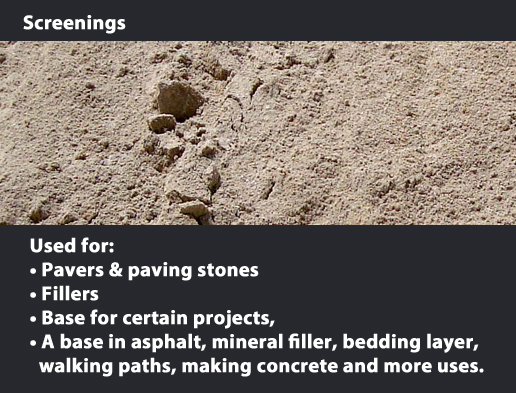 Screenings are used for pavers, paving stones, fillers, sometimes base for certain projects, used as a base in asphalt, mineral filler, bedding layer, walking paths, making concrete and many many more uses.